"In their trade, pearl merchants scrutinize color, size, shape, luster, and surface perfection. 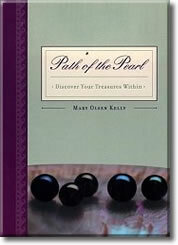 With the pearl as a metaphor, the reader assesses her own life’s journey based on the same criteria. Path of the Pearl seeks to connect women with their deeper selves and illustrates that even the most painful challenges can be transformed into things of beauty. "Powerful tools and techniques for transforming life’s challenges into creations of beauty."